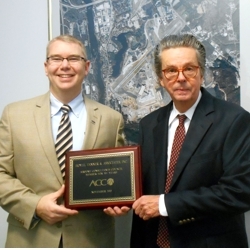 At the end of 2015, ACC recognized its long standing members of 30 plus years. In 1978, Hoyle, Tanner was a founding member of ACC. To be one of four founding corporate members of an organization of over 200 is an honor we are proud to share with our friends and clients. Hoyle, Tanner continues to remain active in this organization, holding positions in the Engineering Committee and Advocacy Committee. Shown here are Robert M. Furey, PE, SrVP, Director Aviation Services Group, and Frank Wells, Managing Director and Chairman of the Board holding the 30 years recognition plaque.